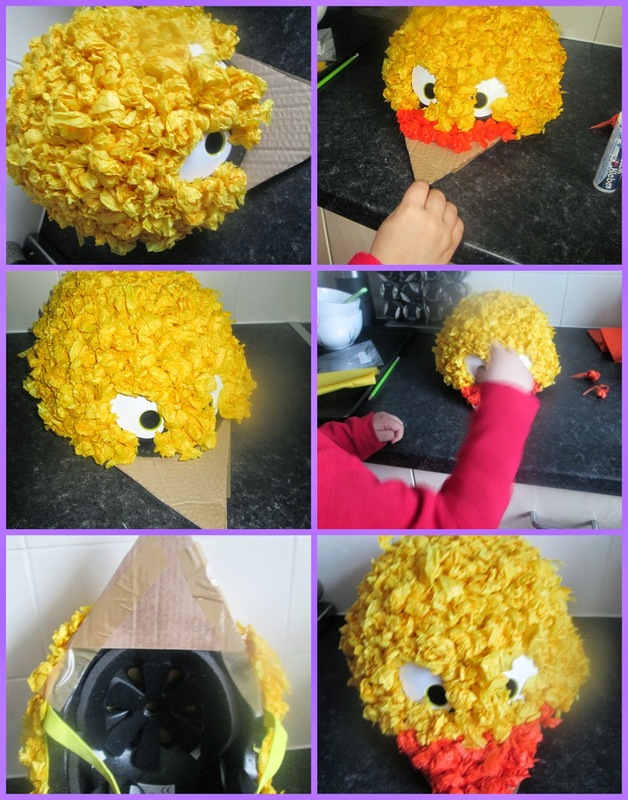 Having looked around online, and in shops for an Easter Bonnet for Liam - all of them seem to be for girls pretty straw hats and fluffy bunnies not much out there that seems to be aimed at boys so with some inspiration from my mum and some super gluing efforts from Liam we came up with and made our own simple to make Easter bonnet. First of all cut a triangle out of the card bored and secure it to the hat, I used glue but it still felt loose so I popped a bit of sellotape on the underside if you are using a plastic hat with a peak skip this step! 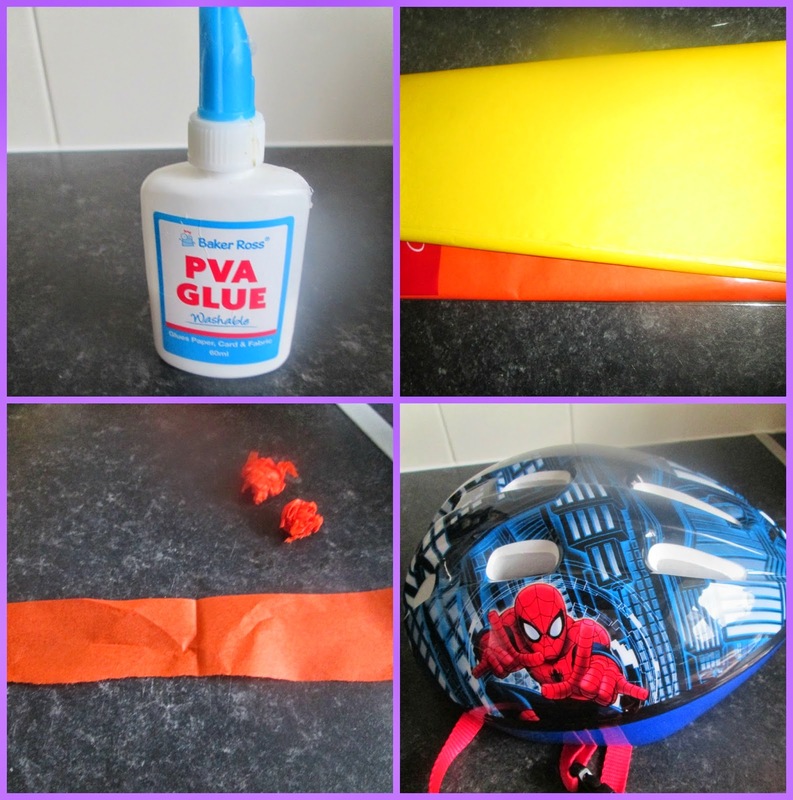 Then Start screwing all the yellow tissue paper into balls not to tight, then apply the PVA glue to the hat or helmet simply work your way around the hat making sure all is covered but the peak of the hat or the triangle that you have just attached. Once you have covered the hat, start screwing up the orange tissue paper and cover the triangle or the peak of the hat, once you have done this, the bonnet is nearly complete. I was lucky with our hat it already has eyes on it but to make the eyes just cut out some pieces of white paper into an oval shape and draw on the pupils then just affix them on with some PVA glue. The Bonnet principle of making this hat could be used to make a Rabbit fixing on white ears and white tissue paper, or a sheep, cow, and you could even make a duck! 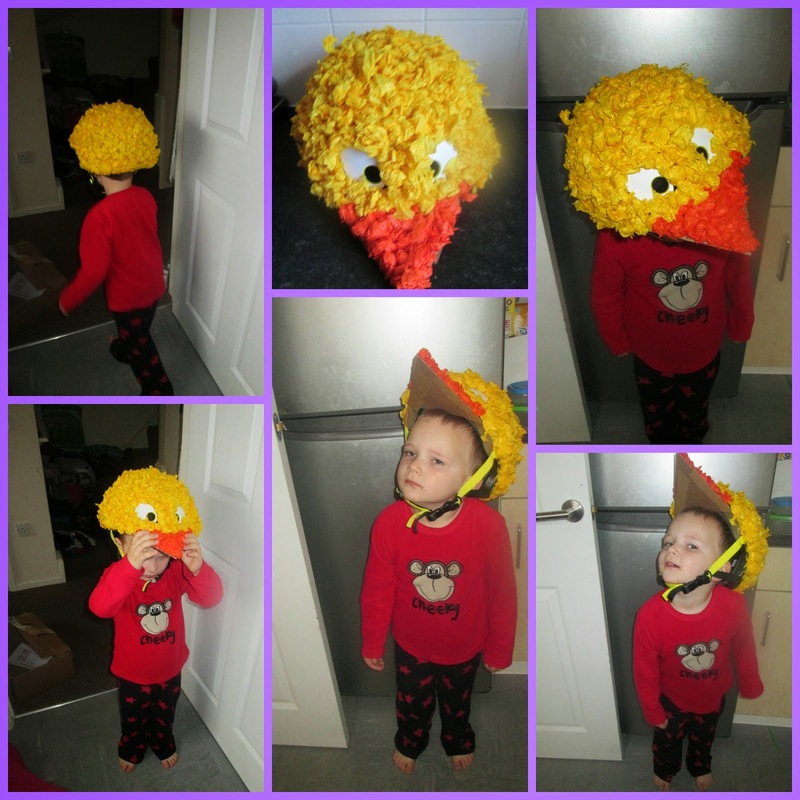 the possibility are endless we loved making our hat and Liam cant wait to wear it to his parade on Wednesday. What a good idea. Yes lots of yellow and pink with flowers but not so much for boys! yes I am thinking that I am going to change the beak to a round one it looks a bit harsh lol! Helen thats amazing!! i love it!